Last night at the installation meeting of Thistle & Rose was a special evening, not only for the new Worshipful Master, W Bro Steve Burton, but also for Bro Paul Beard Provincial Grand Organist.. 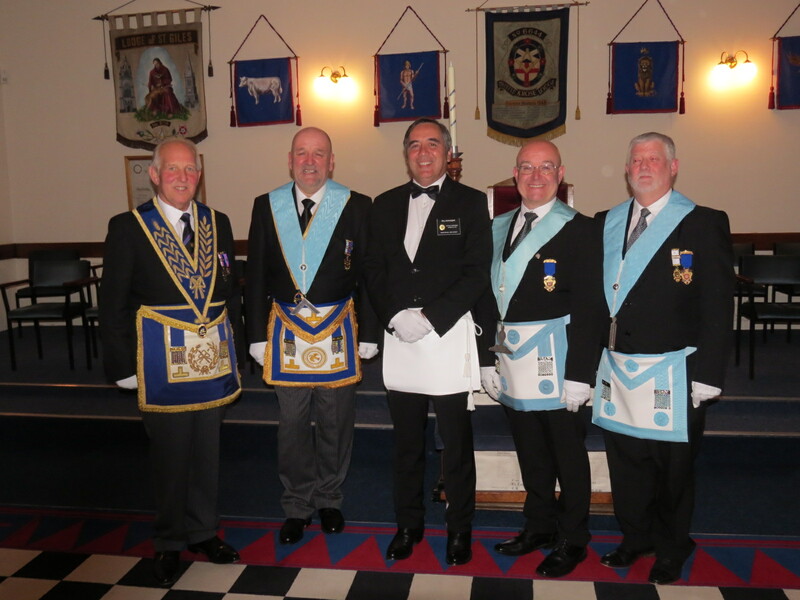 Along with the Provincial Grand Masters representative, W Bro. Francis Margot, over 60 brothers sat down to the Festive Board, after the installation and the presentation had taken place. Amongst those enjoying the evening where WBro Ken Marris and WBro Trevor Wayman who attended the same school as Paul. 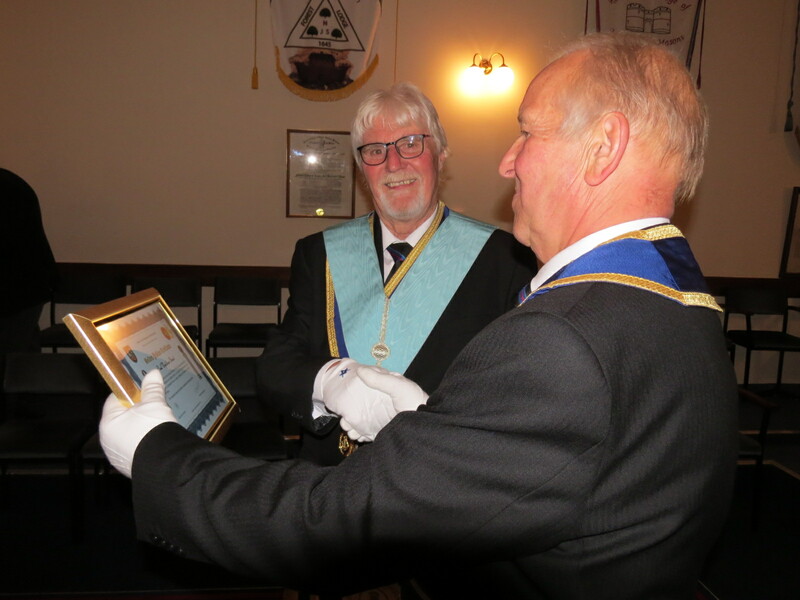 Brother Paul has provided a few words to describe how he still enjoys providing music for Lodge and his Masonic journey so far. It all began for me in 1961 when my father, Bro. Charles Beard, proposed me as a candidate for Cytringan Lodge #4048 as a 21st. Birthday present. 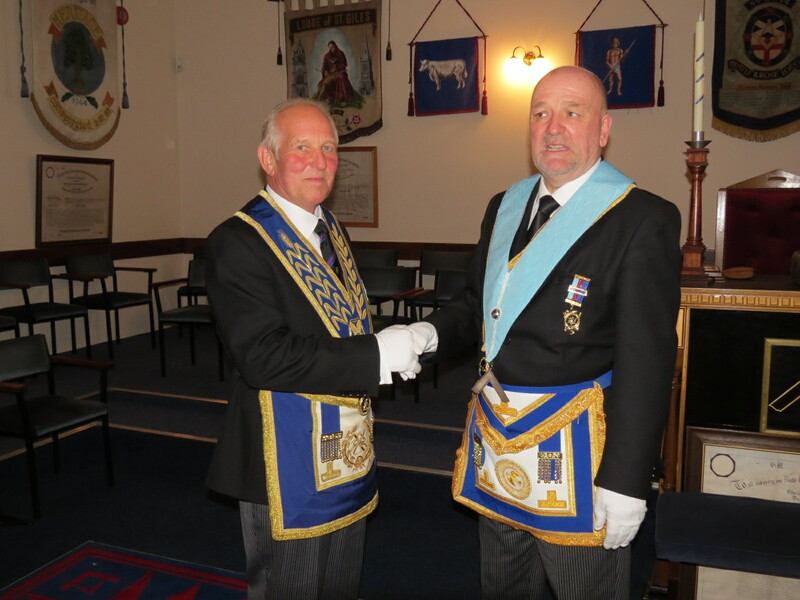 The application was seconded by W.Bro. Roly Barlow. In those far off days a 7 year waiting list was not uncommon and I got a year knocked off that as a ‘Lewis’. I remember well ascending the long staircase in Kettering Masonic Centre and wondering what the heck I’d let myself in for on the occasion of my Initiation on 2nd. January 1967. Passing and Raising swiftly followed and it soon became apparent to me that music played an important part during our ceremonies and at the festive board. 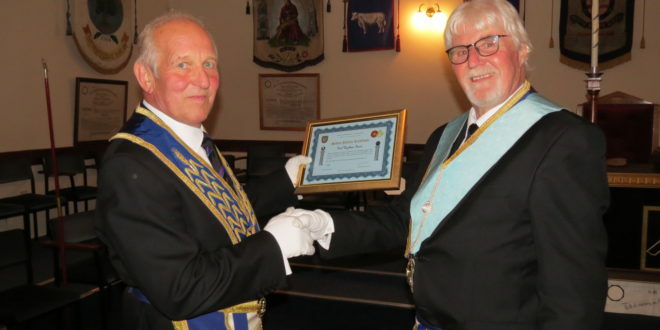 Very soon I was able to assist other Lodges when they were in need of an organist and, in particular, Thistle & Rose Lodge who, at that time, met in the Lutheran Hall, Corby. Playing an old piano on the balcony was a great experience!! In 1977 my wife Sue and I moved to Oxfordshire where I soon got involved in the Masonic scene and becoming a founder member of the Norton Lodge who met in Chipping Norton. There was quite a shortage of organists in Oxfordshire and I assisted other Lodges in Oxford, Witney, Burford, Woodstock & Bicester. Acting Provincial Organist honours came in 1987. I was then a full time Organist and Deputy Manager at Oxford Crematorium and in 1999 we moved to Crawley, Sussex, as General Manager. For 10 years the constraints of the job made weekday Lodge attendance difficult but I was able, on many occasions, to play for Friendship from Service Lodge & Fulcrum Lodge who met in Great Queen Street on a Saturday. On occasion I played for Acacia Lodge – a Funeral Directors Lodge – who met in the Angus Steak House in the Strand having, on two occasions, been kicked out of other venues for bad behaviour! With the advent of a planned early retirement Sue and I returned to Northants late in 1999 and we settled in Desborough. It was so good to meet up again with two old Kettering Grammar School chums, W. Bros. Trevor Wayman & Ken Marris and so pleased that they are able to be here this evening. 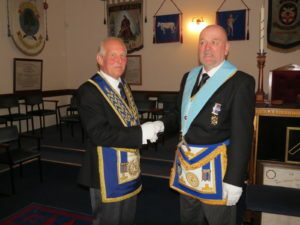 We had lost touch over the years and it is wonderful that Freemasonry brought us together again. They no longer help me with my homework though! I took over as Organist of Thistle & Rose from the late Bro. Don Parker. The year 2005 saw me become a Founder Member and Organist of the Graham Milton Lodge and I have been a guest and honorary Organist of Old Wellingburians Lodge since 2004. 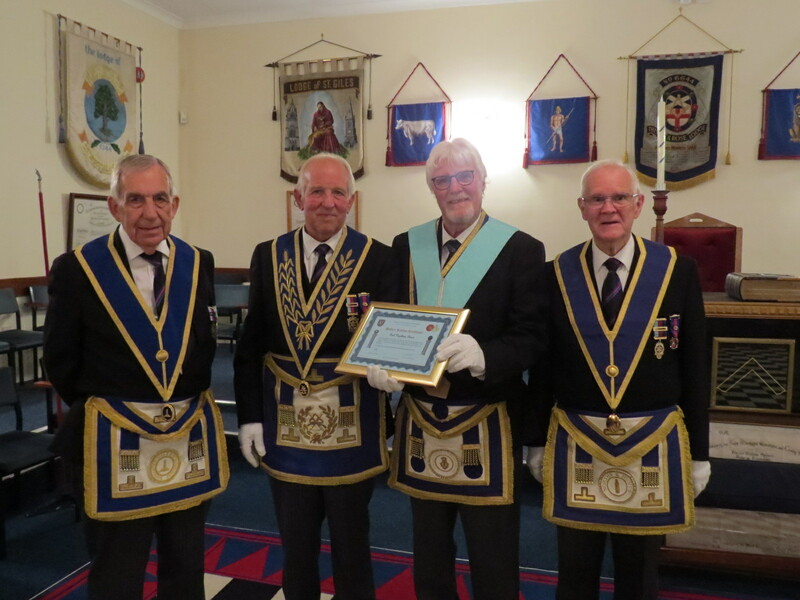 I was honoured to receive the acting rank of Provincial Grand Organist for Northants & Hunts a little over 3 years ago and I am most grateful to W.Bro. Chris Winfield – the current holder of that happy position – for giving me the night off this evening. Previous Fancy an early Christmas Dinner and Dance ? Saturday November 17th.